I needed a birthday card for a 6 year old. Though, I have some princess stuff, I didn't want to get all glittery last night (I really am not a girly girl!). So I looked at some items left on the desk - some punches and then remembered the current challenge at Cards & Things. Two in One = sweet deal! Two things: 1)I used BUTTONS again... see.. I knew I could get into the groove of using them. 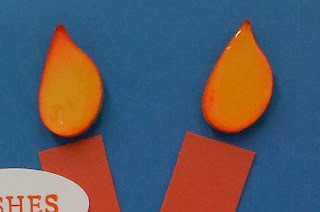 2) I used the wing of the Two step bird punch for the candle flame. Maybe tomorrow I will challenge myself NOT to use PUNCHES? ... Nah, I am going that far! 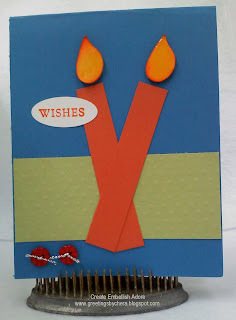 Hi Chera, you did a great job with the challenge ! Thanks for playing along !